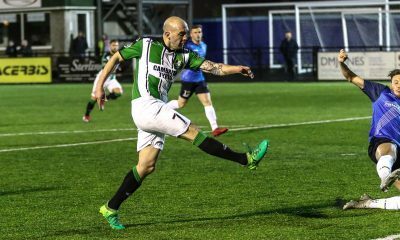 A DOUBLE from in form Marc Williams, allied to a defensive masterclass earned the Black and Greens a vital victory over Cardiff Met on Saturday afternoon (Feb 23) at Park Avenue, which ensures the fight for a UEFA Europa League Play Off place will continue into March. 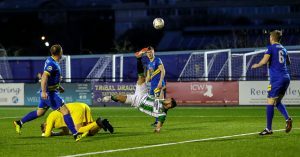 Williams opened the scoring on 58 seconds, intercepting a clearance from Met keeper Alex Lang, and repeated the trick just after the hour with a low drive from further out. Town now stand just two points behind Met on 34 points with six matches of the regular season remaining. 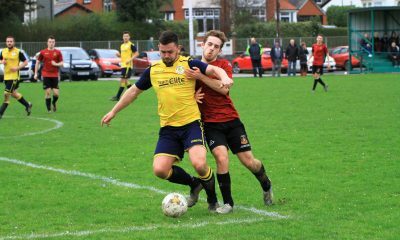 On a balmy day which heralded the start of Springtime, the hosts had a dream start when Williams chased down a Met back pass and keeper Alex Lang’s clearance deflected into the net off Town’s Super Sparky Striker, after just 58 seconds. A hectic period ensued as Met’s Adam Roscrow saw a shot blocked and Dylan Rees fired over. At the other end Paolo Mendes, who was having a super game snapping at Met’s heels and breaking up play, headed wide from Wes Baynes’ free kick. The ever dependable Ryan Wollacott denied Chris Baker a chance by clearing Roscrow’s dangerous cross, and back up the field Ash Ruane almost repeated Williams’ trick by chasing down another backpass, but to no avail. 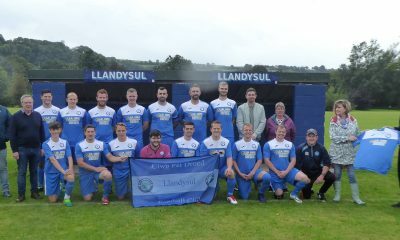 With Town sitting deep and allowing Met possession in their own half, livewire Geoff Kellaway was always a threat on the break, and when the imperious Williams won the ball and played him in he clipped the post agonisingly with a cute effort past Lang. 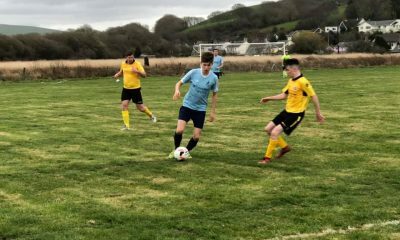 Emlyn Lewis’ cross was easy for home keeper McCormick, and just before the break Elliott Evans’ was so close to equalising when his free kick from 30 yards brushed the top of the net, but disciplined Town held out for a deserved half time lead. 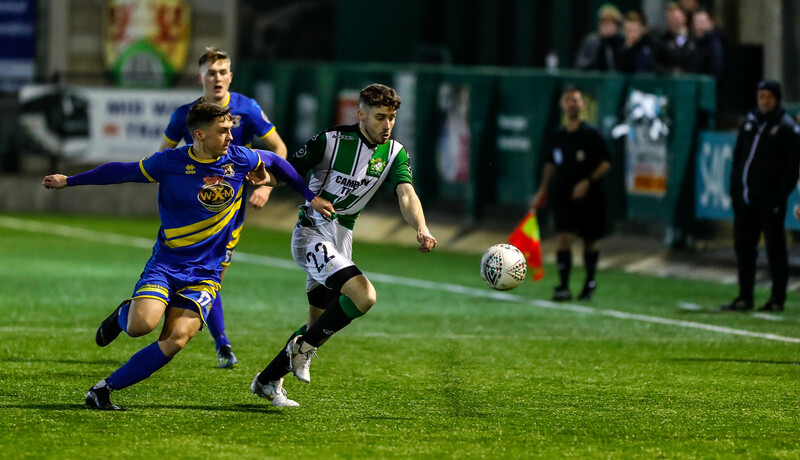 Met tried to up the pace after the break but Wollacott did well to block Will Evans, before Kyle McCarthy’s testing right wing cross flashed across goal only for Elliott Evans to hit the outside of the post at the back stick. 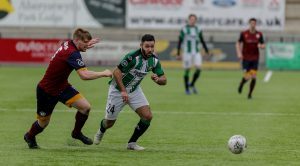 The second half followed a similar pattern to the first with Aber defending deep, superbly, and Met struggling to find space in the final third to create opportunities. Town threatened as Ruane then found Williams, and his flying snapshot was somehow deflected to safety, Ryan Edwards’ effort flew wide, before Harry Owen responded for Met with a grass tickler which brought McCormick into play. 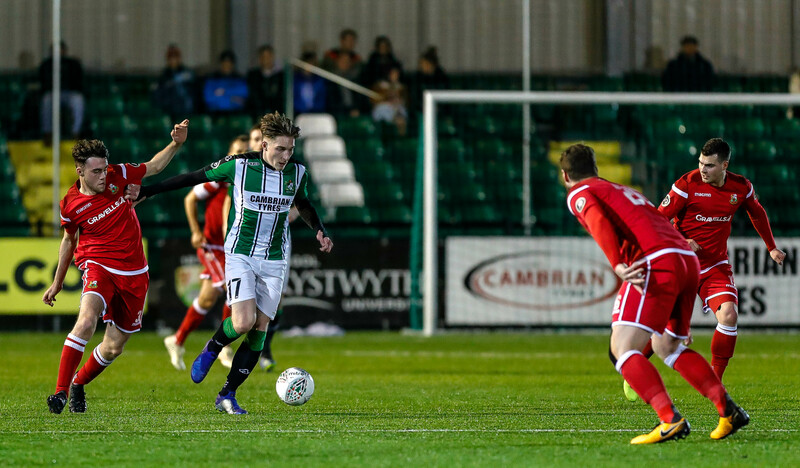 Then Williams intercepted the ball on the half way line and broke down the right before firing a super second low down into Lang’s bottom right hand corner, to give Aber the real scent of victory. Aber had a penalty shout when Lewis, already on a yellow, tangled with Ruane in the box, but then McCormick pulled off a great save from Will Evans to safeguard the hosts’ clean sheet. 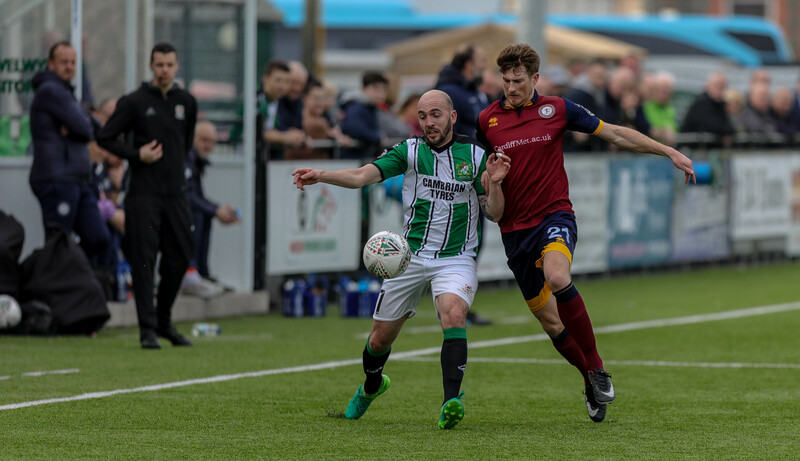 Some late drizzle could not dampen the hosts’ ardour, and when Will Evans’ lob sailed over the bar with three minutes to go, the job was done, and Aber had a crucial victory. 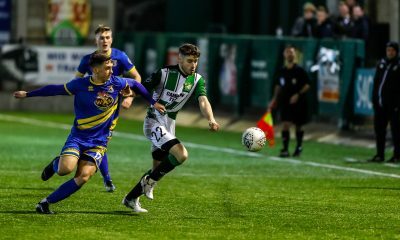 With Aber earning their first clean sheet since November top marks must go to the defensive six of McCormick, Declan Walker, Baynes, Wollacott, Steff Edwards and Matthew Jones, but Williams, Kellaway and Ruane also caught the eye going forward, and Mendes and Ryan Edwards did brilliantly at their job of breaking up play and moving Aber forward also. 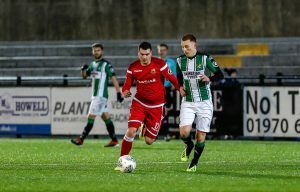 Two wins and a draw from their first four matches after the split has given Aber’s season a big boost and the Black and Greens will look forward with confidence now to their next assignment, when Carmarthen Town visit Park Avenue a week on Friday, March 8, (ko 7.45pm).